The largest and southernmost of the stunning Greek Isles, Crete is a vibrant mix of ancient ruins, sunny beaches, crystalline waters, and quaint, picture-perfect towns and villages. The island itself is imbued with an irresistible and lively spirit, which is reflected in the warmth and openness shown by its people, who are always happy to welcome visitors to their little paradise and share their delicious cuisine and local traditions. The ancient island of Crete is the perfect study in contrasts: white-washed walls and pale stone ruins sit starkly above the vibrant blue and emerald hues of the sea, and the northern coast is all unspoiled, sandy beaches, while to the south lie the rugged cliffs and extreme landscapes that the Grecian islands are known for. Crete enjoys a history as rich as its culture; while the actual history of the island dates all the way back to the 7th millennium BC, it was most notably the birthplace of Europe’s most ancient and advanced civilization, the Minoans. The Minoans were so advanced, in fact, that they built Europe’s first palace on Crete, the famous Palace of Knossos. Throughout the centuries and due to countless invasions, Cretean architecture is a fascinating amalgam of styles, from Byzantine to Venetian Renaissance and everything in-between. A day-long itinerary on Crete could be filled with endless irresistible possibilities. History buffs can visit ancient architectural wonders like Heraklion, the capital of Crete, where there is an exceptional Archaeological Museum that cannot be missed. Nearby is the famed Palace of Knossos, the first ever to be built in Europe. 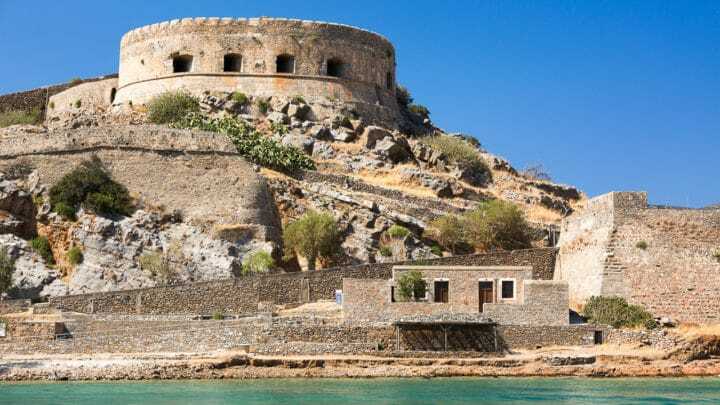 Spinalonga is a tiny island just across from the quaint fishing village of Plaka. Steeped in interesting history, this island was the last known leper colony in 1903, but first served as a fortress built by the Venetians. For the sun-worshipers, beautiful beaches abound, ranging from hidden coves to large, sandy hot spots. While there is no shortage of stunning beaches to choose from on Crete, there are a few spots that are absolute must-visits for any sea, sun, and sand-loving visitor: Agia Fotia is a tiny picturesque gem and local favorite, with a small bay surrounded by stunning cliffs. Chrissi Island is a true showstopper and worth the short boat ride; take a glance at the stunning stretch of soft sand and crystalline waters and you’ll understand why it’s known as “The Caribbean of Crete”. An oasis of calm in one of the more remote areas of Crete, Xerokambos is a well-kept local secret that is perfect for snorkeling. Vai Beach, though perhaps the busiest during high-season, lies at the very tip of the island’s eastern side and boasts incredible white sand and perfectly clear waters. 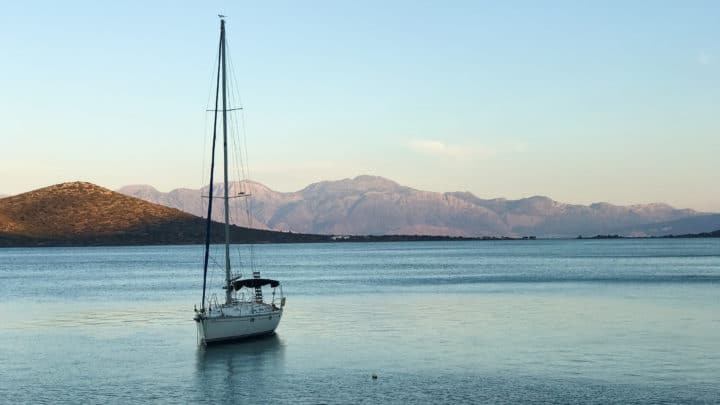 If you need a break from the sun, get a true taste of Cretean culture by exploring one of the quaint rural towns or villages like Elounda, a small seaside town on the southeast side of the island. Enjoy a leisurely lunch at a tiny fish taverna and enjoy the catch of the day, fresh from the sea. Then, take a refreshing afternoon dip in the beautiful and secluded Kolokytha Bay. Tiny Krista, one of the oldest, and arguably, the most picturesque villages on Crete, is filled with lush olive groves and narrow streets lined with shops, perched up on a hill with amazing views. The charming village of Kroustas sits even higher (520 meters above sea level!) and has breathtaking views out onto the vast Agean Sea and the glistening Mirabello Bay below. Spend some peaceful time reflecting and taking in the true spirit of the island at one of Crete’s many ancient churches and Monasteries, which have stunning architecture and well-preserved artifacts and frescoes. Some, like Toplou Monastery, offer an intimate wine tasting from their own local winery. For an unforgettable view, visit Panagi Faneromeni, an all male monastery perched on a steep slope over the Aegean Sea. One of the most significant churches on the island, (a true must-visit spot) is Panagia Kera, where you will find some of the best-preserved frescoes from the Byzantine era. A day in Crete would not be complete without a little time spent surrounded by the island’s natural beauty. Avid hikers will love to explore Samaria Gorge, a registered National Park, and one of Europe’s longest canyons. With soaring cliffs , exotic flowers and hidden passageways, this 16 km hike is a true testament to Crete’s utterly jaw-dropping natural surroundings. Any traveler with a passion for Greek Mythology must visit Psychro Cave, the sacred Minoan spot believed to be the birthplace of Zeus. With its imposing stalagmites and stalactites and incredibly history, this cave is a fascinating natural wonder that fills one with a true sense of awe. Because of its countless activities, cultural sites, and beautiful scenery, Crete is a perfect spot for pretty much all types of travelers, though it would help if you have a penchant for seafood. Beyond the fresh fish and octopus that you’ll no doubt see hanging along the harbors, Crete is also known for its traditional village tavernas. The food on Crete is healthy and fresh, fresh, fresh: from the meat and fish, to the delicious olive oil, wine, and cheese, everything is locally grown. Try some of the traditional delicacies, including raki, a sweetened, anise-flavored spirit, myzithropita, Crete’s famous sweet cheese pie, and Skioufihta, a Cretan traditional pasta made with local myzithra or graviera cheese. The perfect home base for a fabulous Cretan vacation is Daios Cove- Luxury Resort & Villas, a chic hideaway that commands the perfect location on Crete, tucked away in a quiet bay on a secluded curve of the northern coastline. A sprawling property sculpted from rock into the hillside with lush gardens, spectacular views of the Aegean, and a stunning stretch of pristine sandy beach, the true draw of Daios Cove is the perfect blend of the resort’s extravagance with the unspoiled, magnificent topography that frames it. While the property is grand in scale, the secluded location and private bay make for an intimate, peaceful ambience. Daios Cove is easily accessible from Heraklion International Airport (50-minute drive). There are direct flights available from Europe (London, Paris, Berlin, Rome, Milan, Brussels, Barcelona, Madrid, Vienna) throughout the week, as well as a private helicopter pad onsite. Opened in 2010, the sprawling luxury oasis attracts well-heeled travelers of all types, from couples seeking a secluded romantic getaway, to families craving a fun yet luxurious holiday together. Daios Cove spans over 86 acres and offers a variety of accommodations, from 210 guest rooms, 41 suites, 39 villas, a presidential villa and 165 private seawater pools. Designed by the Greek 3SK Stylianidis Architects firm, the vibe of Daios Cove is minimalist-chic yet luxurious, set in calming neutral tones that perfectly reflect the relaxed aesthetic of the island of Crete itself. Daios Cove also has six gourmet restaurants, as well as chic cocktail bars and lounges that often play host to renowned international DJs during high-season summer nights. 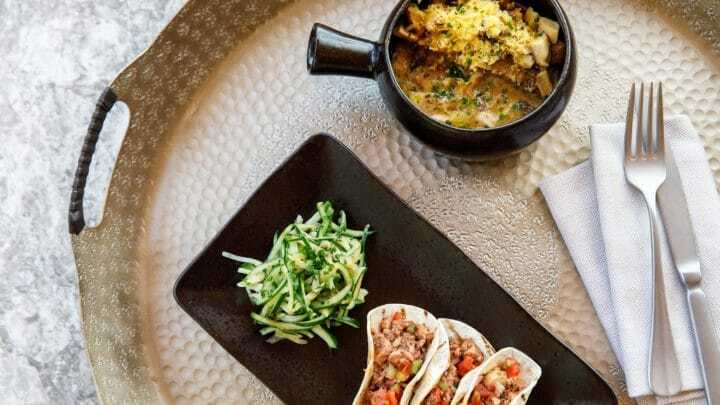 The contemporary and airy Pangea boasts stunning views of the sea, with an international menu celebrating eclectic cuisine from around the world, while Taverna gives guests a more local flavor, with traditional Greek fare and a special Cretean ambiance, especially at night. Catch of the day is not to be missed here, with the seafood being brought in every morning by local fishermen’s kaiki boats. 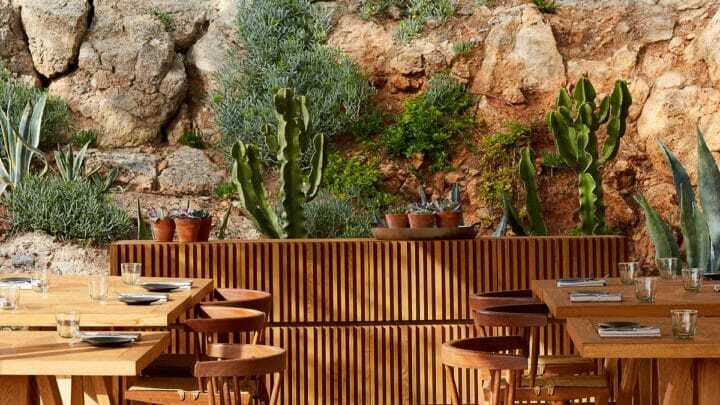 The Beach House is the newest open-air restaurant at Daios Cove, with a sustainable menu of fresh locally-grown and sourced ingredients. At night, the cocktails and music flow, and the stunning setting mixed with the live music (Latin, Funk, Soul, Jazz, Mediterranean, Cretean and DJ sets) has made for a winning combination: The Beach House was named #7 of The World’s 50 Best Bars in 2018, with little wonder why. Beyond the delectable cuisine, Daios Cove also boasts The GOCO Spa and Fitness Centre, complete with thermal and private spa suites. An serene and rejuvenating oasis, GOCO Spa tate-spans 26,910 square feet and has eight private treatment rooms, two facial studios, three body treatment rooms, two double suites and a beauty salon. Guests can also enjoy a variety of signature facial and body treatments by French spa specialist, Anne Semonin and Spa/Clinic by 111Skin as well as fully-equipped fitness center that offers yoga, pilates and personal training sessions upon request. There is a plethora of on-land activities at the Cove for guests to enjoy, including a luxurious Residents’ Club, Children’s Club, and tennis courts. Guests can also private tours to archeological spots such as Knossos Palace, the village of Krista. Chrisi island and more, as well as day trips to Crete’s most picturesque villages. Daios Cove also offers land and air tours: explore the rugged terrain by open-air Land Rover and see the rural beauty of Crete’s mountain villages or take to the skies in a private helicopter for unparalleled views of the island and the surrounding seas. But one would be remiss not to take advantage of any of Daios Cove’s water activities. Through Daios Cove, guests can rent a private yacht, catamaran, or RIB boat and sail to secluded islands, beaches, and coves for an unforgettable day exploring Crete by sea. Scuba diving, snorkeling, canoeing, and kayaking are also available at the resort. With stunning beaches and unbeatable views, spacious and comfortable accommodation, and abundant activities to choose from, Daios Cove is truly a destination unto itself on Crete, a secluded Grecian paradise just waiting to be discovered. Because of its balmy European climate, Crete is a popular destination for visitors almost year-round. May—October is the ideal time to go to enjoy the warmest weather and make use of the stunning beaches, though spring is a good time to sightsee on Crete while the island’s flora and fauna are on spectacular display. To get there, it is a long (12 hour) yet still relatively easy and scenic ferry ride from the bustling mainland, or alternatively, a short plane ride from Athens airport.